What Are The Best Horse Riding Boots On The Market? A good pair of boots can be a rider’s best friend. The best horse riding boots are sturdy enough to withstand some hard riding, and totally waterproof for those hard winters. Having a warm pair is also a massive bonus, for cold winter rides where your toes end up feeling like blocks of ice! The best horse riding boots are out there, but it can take some serious internet browsing to find the really good one. 2.1 1. Why do you need good riding boots? 2.2 2. What are the various types of English riding boots? 2.3 3. How do you choose the right English riding boots? 2.4 4. How do you choose the best Western riding boots? 2.5 5. How do you get the right fit in a Western boot? This quality leather riding boot is ideal for those just starting out in riding. They are great for everyday use, being comfortable and durable, and are made of good leather, meaning they will last. Front zipper makes it easy to put on – No struggling to pull this boot on, even over thick socks! The front zipper makes putting the boots on super easy, so you can get out of the door to the yard even quicker. Very comfortable out of the box – No need for oiling or breaking in – these boots are supple and comfortable right from the get go. High quality leather uppers – This means the boots will be waterproof and will last and last, so it’s more of an investment than a cheap pair of boots that will give up the ghost quickly. Rugged and hardwearing – These boots are strong enough to withstand the rigours of all outdoor work, from riding to mucking out to everything in between. Boots run small – Don’t disappoint yourself by ordering your usual size. These boots are on the small side, so make sure you get a bigger size so that they fit well. These are good, high quality boots which will really help your foray into horse work. They are well made and strong, and will last you for years to come. They also look amazing with a pair of half chaps! These all-weather boots are great for getting out and about in the hills, fields and stables. Made of a sturdy synthetic leather, they won’t break the bank either! Weighted heels to keep good riding posture – “Toes up, heels down” is drummed into us at an early age, and it’s very easy to do with these boots, as the slightly heavier heel will keep your heels where they’re meant to be. Elastic gussets for extra comfort – Having the extra little bit of give can make all the difference in the comfort of wearing, and the ease of getting the boots on and off. Spur rests – If you have a horse who needs a bit of a kick on, then having a place to rest your spurs is useful so they don’t fall off and get left behind in the mud. A good budget buy – These are relatively inexpensive boots, so they are a great buy for those who are just starting out and are unsure if they will continue, or those who have to buy lots of boots for children or riding schools. Can take a while to break in – It has been reported that these boots can be uncomfortable when you first wear them, but after a bit of use they soften up. A good buy for those who want a pair of boots that are inexpensive, but will still do what they say on the tin. These are long boots, very well made and high quality. They are multifunctional, being ideal for riding as well as general yard work and mucking out. Waterproof and breathable – This allows for extra comfort, as your feet won’t sweat and neither will they become too cold to function. High quality materials – Made of the finest leather and suede, these boots are a cut above the rest in terms of class and quality. Strong, sturdy boots – As you would expect from a good riding boot, these are hardwearing and can withstand a bit of abuse. Ideal for riding or yard work – These are very versatile boots, being suitable for the trail or the stables. On the pricey side – You pay for quality, everyone knows that. These boots come with a fairly hefty price tag, but as they will last you for years then they are an investment rather than an expense. These boots really are a cut above the rest. They are attractive as well as highly functional, and perfectly able to do the job they are meant to do. Having a longer boot means that you won’t need to wear chaps over the top to prevent pinching of the calves by the stirrup leathers. 1. Why do you need good riding boots? 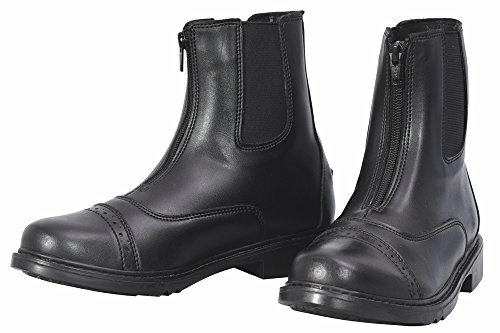 Sturdy, well fitted riding boots provide support, safety and security when you ride. 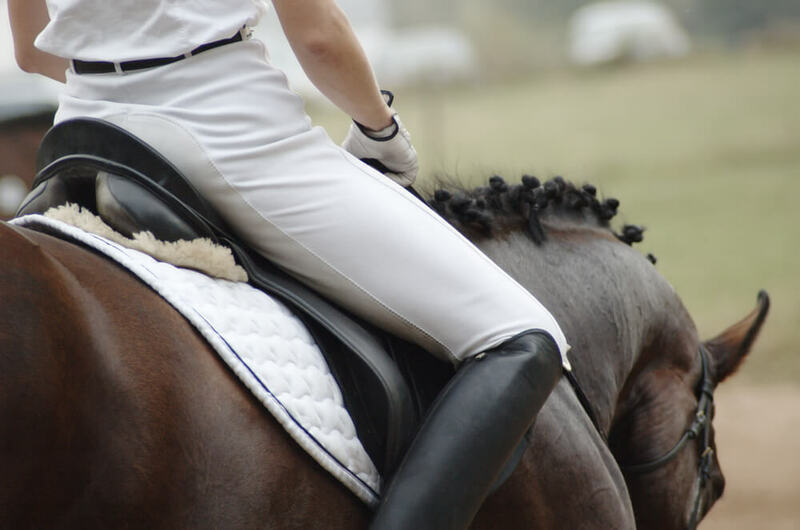 Good boots can keep your foot from slipping through the stirrup, prevent damage to your feet and toes if your horse happens to step on your foot and help you move appropriately in the saddle for challenging activities such as jumping. 2. What are the various types of English riding boots? Field boots have laces on the front for more customizable fit in the ankle. These boots are especially good for jumping as they allow a deeper flex in the heel. Dressage or dress boots look quite a bit like field boots, but they do not have laces. These boots are stiffer and more formal. They are especially designed for showing and dressage. Hunt boots are quite dressy and are topped off with black patent leather. Sometimes the top part of the shaft is in a mahogany shade of leather. These boots are strictly formal and are often seen at foxhunting events. Short English riding boots are the same in the heel and toe as the other types of boots, but the shorter body makes them more flexible and practical for every day riding and barn and stable chores. Jodhpur or paddock boots are also short boots. These have heels that are especially designed with a pronounced heel that prevents your foot from sliding through your stirrups and a slick sole that keeps your foot from sticking in the stirrups. Paddock boots are typical garb for children, and adults wear them for every day use and for trail riding. Wellies and muck boots are every day chore boots to be worn around the barn and stable. They are waterproof or even made of rubber and will keep your feet safe and dry even in the wettest weather. 3. How do you choose the right English riding boots? Choose the correct size. If the boots you have in mind are offered in UK sizing and you typically wear footwear sized in US or Canadian sizing, be sure to check the chart and get the right size. If shopping online, be sure to read reviewer’s comments. Make adjustments for size accordingly if many reviewers say that the boots run big or small. Remember to measure your calves as well as taking your foot size into consideration. The fit around the calves should be snug but not excessively tight. You should have just a little bit of difficulty pulling your boots on and off. When buying tall boots, choose a shaft height that will rise to the center of your kneecap. Even though this may feel a little uncomfortable at first, the boots will settle an inch or two as they break in. This is desirable. If you purchase boots that are too short, you will not have the proper fit. If you are shopping in person, be sure to wear the clothing that you will wear with your boots. This includes your riding socks, pants and chaps if applicable. Be sure the foot bed is comfortable, and pay especial attention to the ball of the foot. Remember that this is the part of your foot that will be in contact with the stirrup the entire time you are riding. 4. How do you choose the best Western riding boots? Determine what you will be using the boots for. Classic Western boots have a higher shaft and an angled heel that is usually about an inch high. 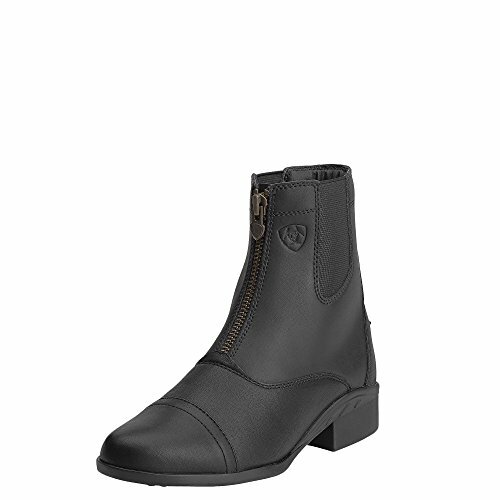 Roper style boots have a shorter shaft and the lower heel. For general riding, a classic Western boot is fine. For challenging disciplines, such as roping, choose a roper boot. 5. How do you get the right fit in a Western boot? When you try on a Western boot, you should hear a slight pop when you slip your heel into the boot. If your foot slides easily in and out of the boot then it is too wide for your foot. With Western boots, you want a fit that will keep the boot on your foot comfortably as you walk and move about, but the boot should also come off easily if you lose your seat and your foot happens to be caught in the stirrup. Smart riding gloves or good looking jeans are great to have; however, a good pair of riding boots can make the difference between a comfortable experience, whether you are riding or doing jobs around the field, and a miserable one. Investing some money into a good pair of riding boots is highly advised, because they will be on your feet day in and day out – and YOU will be on your feet day and day out too! Take the time to search for the best horse riding boots for you, and you will never look back. If you want a quality pair of leather boots that are suitable for all types of horse work, then go for the Ariat Women’s Scout Zip Paddock Boots. If you are on a budget, or looking to buy multiple pairs of boots then the Tuffrider Ladies Starter Front Zip Paddock Boots would be ideal for you. For those who want a pair of long boots which look good and are functional, the Ovation Women’s Country Boot Kenna are for you. 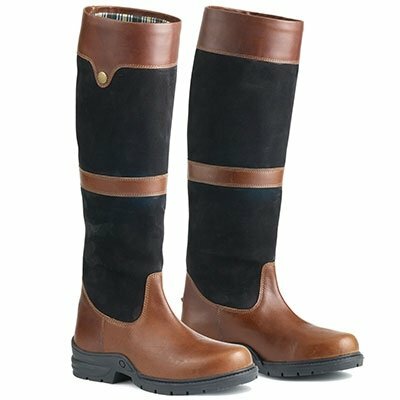 Oh, I really like that TUFFRIDER LADIES STARTER FRONT ZIP PADDOCK Boots you have listed here. I would usually go with a different color, but even if black was my only choice, I think I’d be OK with it!